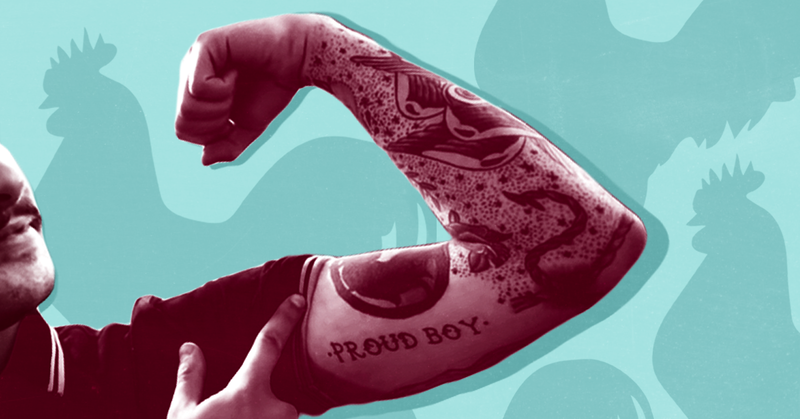 Blog ››› November 6, 2017 10:48 AM EST ››› CRISTINA LóPEZ G.
The video troupe at NBC Left Field has created a glossy short documentary about the self-described “Western chauvinist” organization Proud Boys, uncritically presenting the group as an all-male “fraternal society of nationalists” aggrieved that men are supposedly under attack in America. The short documentary took statements from Proud Boys members at face value without giving audiences the complete picture of this violent-prone organization, which is actually a gateway to extremism like white supremacy. NBC Left Field, an NBC News division that bills itself as “a new internationally-minded video troupe that makes short, creative docs and features,” covered the Proud Boys as a quirky curiosity, naively presenting members’ views as playfully eccentric as opposed to extremist and discriminatory ideologies. NBC team allowed the Proud Boys to normalize and mainstream their extremism by uncritically airing group members statements like “there’s a mainstream societal attack on being a hetero cis white men,” or playing footage of its founder Gavin McInnes saying, “I think it’s fair to call me Islamophobic,” without any pushback. And it did so without mentioning the ties some Proud Boys members have to white supremacy or their philosophy of violence, which they have organized around and acted upon, including in Charlottesville. No wonder McInnes, who habitually rails against mainstream media, was thrilled with the kid-glove treatment. By presenting the group as a solution to the loneliness of men who feel targeted by what one called a “mainstream societal attack,” NBC’s Aurora Almendral inadvertently validated their grievances while failing to give her audience the full picture of what the boys stand for. In reality, American women continue to face a “substantial gender wage gap across the spectrum” when it comes to the labor force and a huge gap in health care costs that doesn’t necessarily imply better care -- this while “men still trail women in life expectancy.” Women have started to outpace men in education, but the results are not reflected in wage equality among peers with the same amount of education -- a reality undoubtedly bolstered by cultural structures like the “pro-housewife” mentality Proud Boys display. The group’s initiation rituals make violence a requirement. As explained by the Southern Poverty Law Center (SPLC), “the highest level of membership in McInnes’ organization, called a ‘Fourth Degree,’ can only be achieved once a member has engaged in violence with antifascists.” A lower level “second degree” involves a prospect being “continuously punched in the body by PB members until he finished naming five breakfast cereals.” Founder McInnes has gone on the record to say he “cannot recommend violence enough. It is a really effective way to solve problems.” The Proud Boys are also "affiliated" with the violent organization Fraternal Order of the Alt Knights (FOAK), which basically operates like a “fight club” or private militia and is considered “the tactical defense arm of the Proud Boys.” Present at the "Unite the Right" rally in Charlottesville, VA, the Proud Boys were not only connected to the chief organizer (a former member) of this white supremacist event, one of their members was later arrested for the vicious beating of counter-protester DeAndre Harris. As Chace reported for NPR, to The Proud Boys -- whose membership is limited to those “biologically male” -- women’s primary role in society is to “stay home and make more babies.” Women are explicitly not allowed at their meetings, and if a woman is simply present “when the readings are happening,” that chapter is booted out of the organization.